New York, USA, 2018-Aug-23 — /EPR Network/ — Over 5 Million people are expected to visit New York City during the historic June 2019 World Pride/Stonewall 50 celebration. World Pride events have taken place around the globe every two years since 2000. This will be the second World Pride on Turtle Island – the land we now call North America. With such a monumental and visible happening in the history of the Two-Spirit, Lesbian, Gay, Bisexual, Transgender, and Queer (TSLGBTQ) movement, it is imperative that the First Peoples of this land are presented with dignity and pride by NYC’s Heritage of Pride (HOP) organization – the local organizers of NYC Gay Pride and now World Pride 2019. 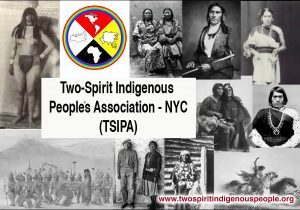 The Two-Spirit Indigenous People’s Association of NYC (TSIPA) is seeking an active partnership with HOP to ensure the respectful representation of Two-Spirit Indigenous People. TSIPA NYC is a task force organizing to support visiting Indigenous relatives with community and safer spaces during next year’s Word Pride/Stonewall 50. In addition, TSIPA is requesting a place in the 2019 March that is respectful of the First People of this land. The task force is also organizing its own Indigenous Pride event entitled “Welcome To Our Fire,” during World Pride 2019. 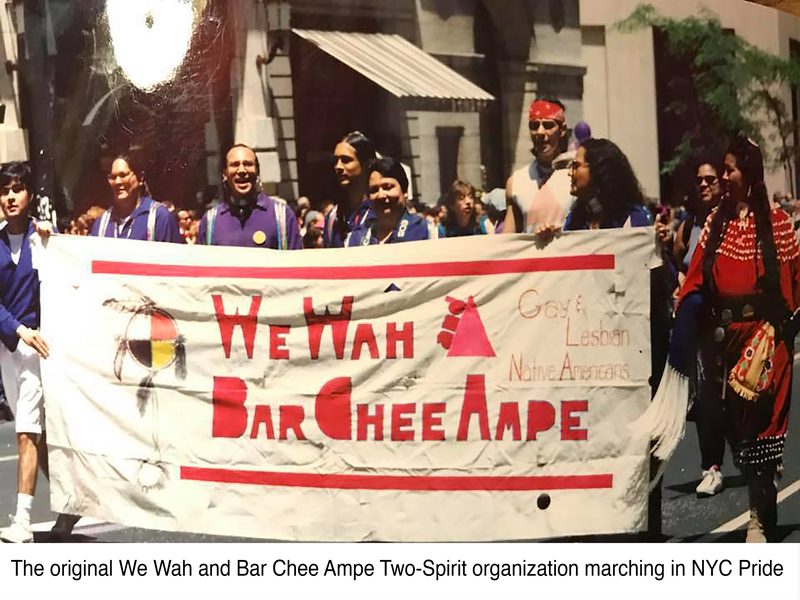 TSIPA’s subsequent events include a Two-Spirit dinner the night before the march, scholarships for those in need of assistance to get to NYC – especially for Elders and Youth. 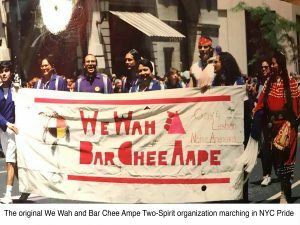 A 2nd Two-Spirits and HIV conference – the first was in 1991, and a Two-Spirit breakfast before the march. A Two-Spirit youth led poetry reading event entitled “Don’t Call Me Berdache,” and the hosting of International Two-Spirit title holders from across Turtle Island. The term “Two-Spirit” is a pan-Indigenous term agreed upon in 1990 at an Indigenous LGBTQ gathering in Manitoba, Canada. The term is intended to unite Indigenous transgender, cisgender, gender fluid, gender queer, and gender non-conforming people from the LGBTQ spectrum under one name. “As Indigenous People, we honor our traditions and ways, but we’re also now contemporary people and a living culture,” Says Sheldon Raymore (Cheyenne River Sioux), a TSIPA organizer and the director of the PrEPahHontoz Tipi Project at the American indian Community House, NYC. The concept of being Two-Spirit can be translated from many Native cultures and languages, as each Nation has its own name for their two-spirit people. In many Indigenous Nations, Two-Spirit individuals were revered and uplifted by their respective tribes before the devastating effects of colonization. Two-Spirit People often had functional and sacred traditional roles among their Nations. Two-Spirit people in fact pre-date the modern “LGBTQ” movement. Curtis Harris-Davia (San Carlos Apache), a TSIPA organizer and one of the founding members of New York City’s “We’Wah and Bar-Chee-Ampe” – the second ever Two-Spirit organization in the United States, has been advocating for the Two-Spirit community since 1989. He continued to do so at the HOP town hall meeting held at NYC’s LGBT Center on August 13th, where he demanded that HOP include the “TS” in “TSLGBTQ” on all print media and communication for World Pride 2019/Stonewall 50. This gesture would show respect for the First People of Turtle Island as well as honor Two-Spirit Indigenous People who are an integral part of the modern LGBTQ+ movement. “We are inviting Indigenous people from all over the world to march with us, and to come to our fire,” says Harris-Davia. 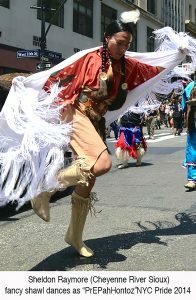 “Not only is Two-Spirit representation crucial during World Pride 2019, but providing culturally appropriate safer spaces for our Youth and Elders to enjoy pride as Indigenous People is paramount,” Says TSIPA organizer Tony Enos (Cherokee), a strong two-spirit activist and singer/songwriter/Producer.